The winter of 2017-2018 is destined to go down in Ohio beekeeping history as one of the worst on record. In October, the OSU honey bee lab had 50 living colonies, but by the beginning of April, we were down to just 5 survivors. While some of these honey bee colonies died as a result of the exceptionally long, cold winter, more than half of our losses occurred before the first snow fell in November 2017. In talking with other beekeepers around the state it has become clear that 90% losses were typical for many beekeepers this year. To replace lost colonies we’ve spent $130 per hive to purchase boxes of bees imported to Ohio from Georgia or California. These new colonies should thrive and grow on the bountiful dandelions, mints, mustards and fruit trees of spring. 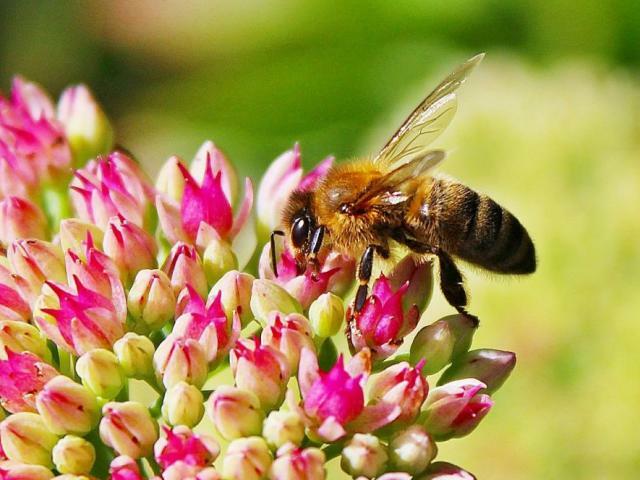 With luck, the populations of colonies will soon be large enough that they will be able to make a honey crop off of clovers, black locust, alfalfa and soybean in the coming months. Some beekeepers will then move their colonies into pumpkins or cucumbers later in the summer. But spring build-up of these young, expensive bee colonies is critical, and early May is the most important period. Unfortunately, colony growth can be directly threatened by corn planting. Insecticide seed treatments used on corn seed generate an insecticidal dust when they are planted. Bees may encounter a cloud of insecticidal dust as they cross corn fields to visit the dandelions and blooming trees in field margins. Insecticidal seed treatment dust can also settle on these flowers that bees are visiting. Insecticide dusts are particularly harmful for honey bees because they do not immediately kill the adult foraging bees that encounter the insecticide. Instead, the dust is packed up with the pollen by the forager and brought back to the colony where it is fed to young bees. So it is the future workforce for the colony that is hit hardest by corn planting-related seed treatment dust. Several years ago, in spring of 2015, we sampled pollen from ten bee yards in the counties west of Columbus. During corn planting, all colonies were bringing back pollen containing corn seed treatment insecticides. While no spectacular bee-kills were observed in our colonies, we did observe a significant increase in the number of dead bees appearing in front of colonies during the week of corn planting in 2015. Honey bee exposure to seed treatment dust during corn planting can be reduced by 1) starting with clean and weed-free fields that are uninteresting to honey bees; 2) following recommendations for using talc or other seed lubricants; 3) following proper planter clean-out and disposal procedures when finished to minimize escape of seed treatment dust.